Messaging is an important part of what we’re doing here in Sacramento. We’re looking at what is being done and sharing our thoughts with you through these UPDATEs, press releases, and e-mails and social media blasts. I recently commented on the state’s budget, see MOORLACH UPDATE — 2016-17 Budget Bill — June 15, 2016 june 15, 2016 john moorlach. It was picked up by the Editorial Board for the OC Register and The Press-Enterprise in the first piece below. The next day it was picked up by the Sacramento Bee’s Editorial Board’s electronic newsletter, The Take, which I edited down for the second piece below. It’s nice that our messages are getting out and that the Bee can give a whole new meaning to "Shafter," the name of a Kern County city (and the home of California State Historical Landmarks #923 and #1022). On the topic of the ongoing high-speed rail debacle, the LA Times just released a piece on how this project will not pencil out. I know, you’re shocked, just shocked. See http://www.latimes.com/local/lanow/la-me-bullet-train-subsidies-20160609-snap-story.html. P.S. 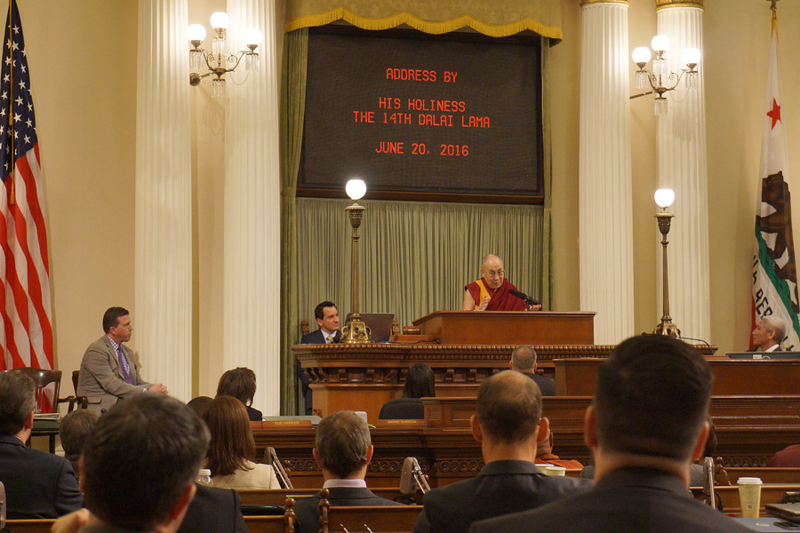 I had the privilege to hear and meet the Dalai Lama during yesterday’s Joint Session (see below). High-speed rail boondoggle still receiving funds from Sacramento. The California state budget passed Wednesday by the California Legislature came in the shadow of the $7 billion tax extension on the Nov. 8 ballot. The budget is for fiscal year 2016-17, which begins on July 1, and anticipates a $4 billion deficit by 2020 – and that’s if there’s no recession. The argument will be that, without the extension of Proposition 30, passed in 2012, crucial state budget items will be cut. But the budget jumps $5 billion above the previous year. On the positive side, the budget places $3.3 billion into the state rainy-day fund, $2 billion more than mandated by Proposition 2, which voters passed in 2014. The fund’s total now will be $6.7 billion. That will prove crucial should the country slide into a recession. The budget increases funding to K-12 education by 4 percent, to $71.9 billion. That fully funds the Proposition 98 mandate that 40 percent of general fund revenues must go to education. And the day before the budget was passed, reported Reuters, “the state announced that it had raised just $10 million from the May carbon permit auction, more than $500 million less than it brought in during the February sale.” Yet 25 percent of that money is supposed to go to the rail project. The vehicle license fee, better called the car tax, would jump $10, to $80 per vehicle on average, taking in an additional $400 million even as gas prices at the pump have been rising recently and are expected to go higher this summer. Although the economy is growing now, the state remains only partly ready to weather the next economic slump. Good morning. On behalf of The Sacramento Bee’s editorial board, welcome to The Take, your opinion-politics newsletter. The Orange County Register: Sen. John Moorlach is right to warn that California is mortgaging its future. And about that high-speed rail boondoggle, Shafter is a long way from Santa Ana.